The Family Panel all suffer from skin irritation- 20SomethingMum and the Tots from Eczema, and Gadget Dad from a nasty allergy to Nickel. 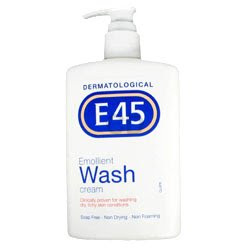 So we've been trying E45's range to see if it can leave our skins silky smooth. 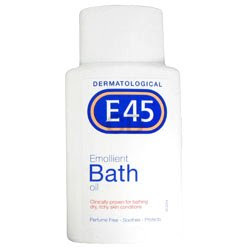 E45 are a company which are probably one of the best known for skin irritation. They do lots for publicising the full range of problems associated with suffering from skin rashes, and not just the itchiness itself, but the bullying that can occur when younger children suffer from it and can be picked on by other children who mistakenly think its catching. So, they have a whole range of reasonably priced products designed to combat the problem as easily as possible without having to use steroid creams- which are effective but can lead to side effects such as thinning of the skin, and cannot be used on the delicate skin of the face. First up, we tried the Bath Wash. This is great just poured in the bath as an alternative to bubble bath. It doesn't leave the bath slippery either, something which is obviously important when bathing the children. It does make a real difference, sinking into the skin, and when used with the bath cream, leaves the skin soft and irritation free. There is also a shower wash too, with a handy hook for ease of use, and again, this leaves the skin its natural colour rather than red after a shower. All the products we tried were applied in the morning during or just after a bath, and by the evening the skin was still noticeably soft and calmed by the products. You could still feel the cream on the skin too, but not in a greasy way. I found that using the creams everyday has all but cleared up my Eczema, and I have found I am scratching less than usual. Which is great news when summer is nearly upon us, a time when irritation due to heat can be at its highest, and at a time when you want to flash the flesh rather than hiding under trousers and jumpers. Highly recommended by all the Family Panel.